and an M-Systems Disk-on-Chip 2000 module from 8MB to 144MB. Expanded Digital Input/Output using an 82C55 PPI Chip (SMT mounted). 4 Key expandable Keyboard connector. Alphanumeric LCD port, with -V(lcd) generator, contrast control and backlight control transistor. Expanded Watchdog IC (MAX813L) with DISABLE, RESET generator and header for external RESET and KICKSTART switches. Separated 10-pin Headers for COM1 / COM2 and RS485. COM2 with RS485, con línea DCD DCD for Modem control. Main Vcc MOSFET for Power ON/OFF using ALARM output of RTC. Analog Input stage with 8 active low-pass filters, bypass capable, and 4.096V Vref buffer(MAX492). Limited/protected input for frequency measurement including Schmitt buffer/inverter. 1 Header for DOS Stamp bus expansion. 1 50-pin Header for 82C55 Ports access, Micro/Sys Netsock/100 compatible pinout. 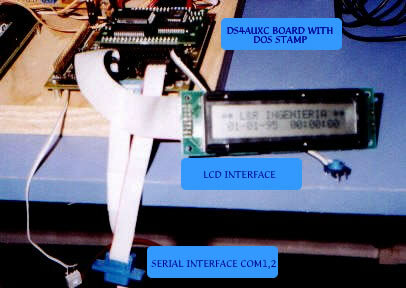 Ease of programming: The DOS Stamp includes the la 80186 Embedded BIOS and DOS 4.0 from General Software, Inc. It include a powerful File System, with support for a subset of the traditional DOS commands. The programming tools (compilers, linkers, cross-assemblers) are widely available and relatively low cost, since they share the wide market of the PCs. By contrast, good quality tools for other processors are in limited offer usually very expensive. A complete Real-Time Operating System with multitasking capability can be integrated, or a simpler, cheaper Real-Time Executive such as uC/OSii of J. Labrosse can be deployed.These executives do not replace DOS, but they provide reliable multitasking and predictable execution timing. 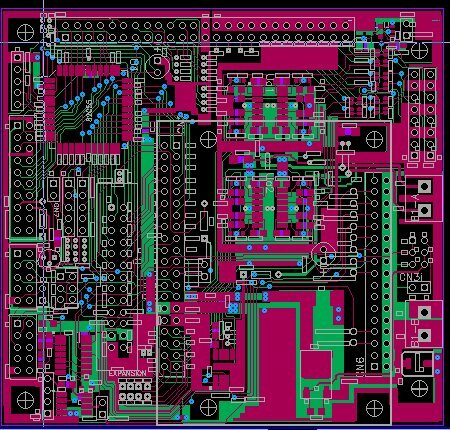 We can provide the DS4Auxc with or without the DOS Stamp (it can be purchased directly from: www.bagotronix.com), with full documentation and board schematics, and a CD with software to start working right away in C.
Figure 2: DS4AuxC Board CAD output. Please contact us for additional DOS Stamp and DS4cAux pricing, info and availability.